Blue Thunder—still America’s #1 racing fuel and the fuel of choice for more race winners over the past decade than with any other brand. World-renowned engine expert Ron Paris formulated Blue Thunder to quickly bring your engine to operating temperature, allow correct tuning of the carb after just a few laps and maintain that level throughout even the longest mains. Blue Thunder Sport Formula is ideal for those who are new to gas cars or for drivers that want maximum protection for their engines. It features a unique additive called ZX-7 that provides over-lean indication protection. When an engine is over-leaned, internal engine temperatures dramatically increase. 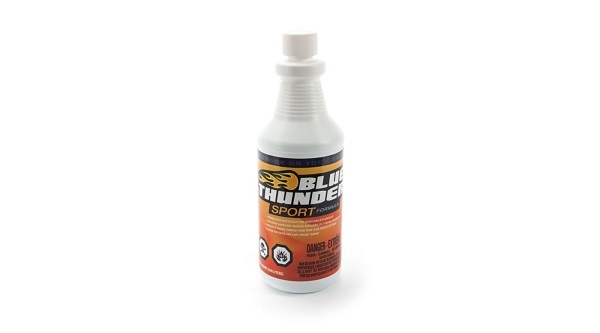 At these critical temperatures, Blue Thunder Sport Forumla actually changes from a lubricant to a combustible, giving an immediate indication to the driver that the mixture is too lean. On the track, if the engine is over-leaned, the driver willl immediately notice that the car will hesitate during acceleration, indicating that it’s time to pull in and richen the mixture. If the engine continues to run at these overly lean settings it will quit before damage to internal engine components occurs. Blue Thunder’s exclusive HP8 formula has been specifically developed and tested for 1/8 scale high performance engines. The Blue Thunder team optimized the 9% caster-enhanced blend found in HP8 to provide crisp throttle response and explosive acceleration without compromising internal component protection. The reduced oil content also allows the engine to achieve optimum operating temperature faster so you can fine-tune your engine with less warm-up time. Additionally, the lubricant package in HP8 provides incredible protection across your engine’s powerband, ensuring that today’s big block engines can run at the top of their RPM range without compromising reliability. Blue Thunder HP8 is a competition-level racing fuel and is intended for use by experienced engine tuners. The castor-enhanced formula allows your engine to be leaned to achieve its maximum performance, while the lubricant package in the fuel reduces internal operating friction, which is vital for long-term engine protection. 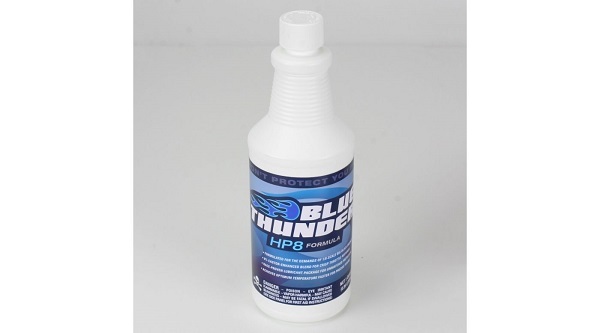 Formulated for serious racers who want to extract every last bit of power from their nitro engine, Blue Thunder HP8 Racing Fuel is the choice of champions.